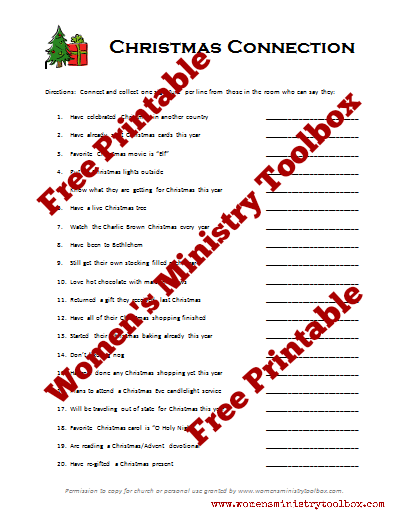 The icebreaker game Christmas Connection is a great Christmas icebreaker to use for your Women’s Ministry Christmas event. It’s a game that is certain to get your group moving and connecting. 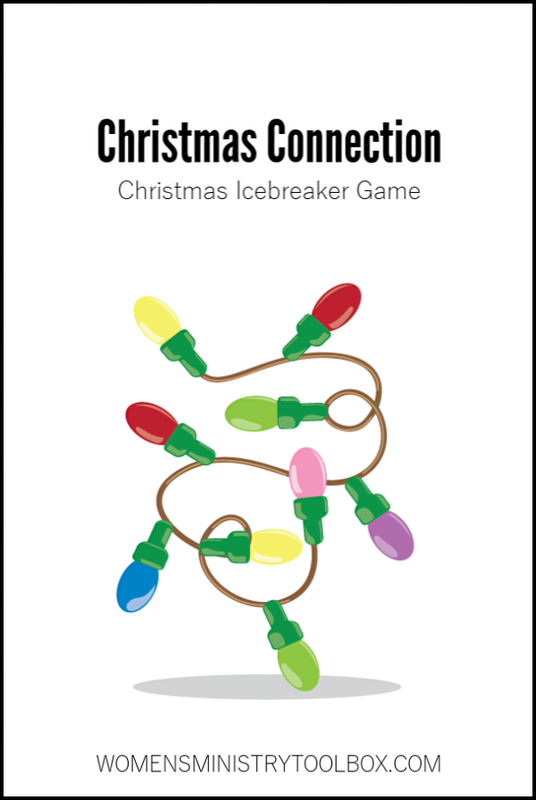 Supplies: One copy of Christmas Connection (click to download free PDF) per person; 1 pen/pencil per person; clock/timer. Instructions: Distribute one handout (face down if possible) to each person in the room. On “go” instruct them to collect one signature per line. For groups of 8-15 allow for no more than 3 signatures from the same person on each sheet. For groups of 15-40 allow for no more than 2 signatures from the same person on each sheet. For groups of 40+ only allow no more than 1 signature from the same person on each sheet. The game ends at a designated time (i.e. 10 minutes) OR when the first person has completely (and correctly) filled their paper. Connection points include: Favorite Christmas Carol is “O Holy Night”; Have re-gifted a Christmas present; Plans to attend a Christmas Eve Candlelight service; Has a live Christmas tree. Winner: The first person to correctly collect all needed signatures OR the person with the most signatures when the time is called. Notes: This game is great for bonding group members that may not know each other very well. Make sure your group has name tags on. Expect your group to get loud. Limiting the number of signatures a person can put on another’s paper forces them to interact with more people.